Also Recommended: Clannad (TV), Kanon. Notes: Based on the dating simulation game of the same name by VisualArt's / Key. Alhough based on the same material, this is not directly related to the television series from Kyoto Animation and is regarded as a standalone work. This was the final movie directed by long-time anime director Osamu Dezaki, who died on April 17, 2011 from lung cancer. High school student Tomoya Okazaki hated going to school and only did so out of obligation. One day he meets a girl named Nagisa Furukawa, who follows the boy to school every day onwards, claiming that he gives her the energy to climb up the stairs to school. She tells Tomoya that she wants to re-establish the school's Drama Club, which he reluctantly agrees to do after a little pressure from the girl. He gets his friend Youhei Sunohara to join as well to complete the minimum three person requirement. At night, though, Tomoya is constantly plagued with nightmares about being alone in a world of nothingness, dreaming about chasing after someone. But is there more to these dreams of his than he thinks? Could they have something to do with Nagisa? Welcome to the Clannad movie, or as I like to call it, Clannad Reduced, since it focuses almost exclusively on Tomoya and Nagisa. In fact, except for Sunohara and Nagisa's parents, pretty much all the side characters from the game are regulated to bit parts at most. And believe it or not, it works a little better this way. While I'll admit that some of the side characters in Clannad were fun and amusing, I really wanted to see Nagisa start up her drama club. Instead, in the T.V. 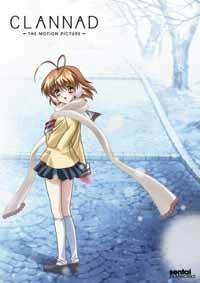 series she serves as a background character for the grand deal of the series as the others' pasts and stories unfold in front of her and Tomoya. Even more annoying to me was that two characters' arcs alone took up half the series! The Clannad movie already gets off to a better start by not weighing itself down on characters. Everything is done in simple plot progression, whereas the T.V. series put a giant STOP sign in front of Nagisa every time it seemed like the series was finally going to be about her. Despite a running time of only 90 minutes, Toei's writing staff manages to combine the cute, funny, conflicting, sad, and heart-tugging moments that the Key franchise is known best for churning out. It even has a cute little song number about the Big Dango Family, sung at one point or another by nearly the entire main cast (even Tomoya, albeit reluctantly). Of course, a good plot can be hampered by lousy characters, but Clannad doesn't do this. One reason might be that its female lead is one of the happier, more cheerful girls in an anime I've seen in quite a while. Nagisa looks at things such as school in a happy viewpoint in contrast to that of Tomoya's gloomier one. She's not clumsy, stupid, violent, or boy-crazy either. And unlike Ayu from Kanon or Misuzu from Air, she doesn't add suffixes to the end of her sentences (thank goodness). She may be a little drab for a lead female lead, but she's genuinely a likable character. Tomoya isn't as interesting as he is in the T.V. series, but his nightmares and the revelations that come from them and how they unfold is a set-up for the movie's final events. He at first finds Nagisa's behavior silly and odd (if I saw a 19 year-old girl drawing odangos with eyes on them to raise awareness for a school drama club, I would too), but eventually grows to like her more. And then there are the other characters. We have Sunohara, a former soccer ball star who's since fallen from prime, regulated to the role of a class clown. In the television series he often got into fights with another girl in school, only to be defeated by her every single time. This does not happen in the movie (though he does get physical punishment by an unsuspecting character at one point in the film), which allows him to be a little more friendly and open-minded to Tomoya's ideas, even (reluctantly) joining the Drama club alongside him and Nagisa to complete the club's 3-person requirement. He even helps poor Nagisa out when her attempts to recruit new members fails early on. Nagisa's parents are decent characters as well, especially her father. In fact, when Tomoya goes to Nagisa's house for the first time, the first thing her father does is drag out Tomoya to play baseball with him to see how much of a man he is! Later at dinner he offers Tomoya both cigarettes and sake, which Tomoya accepts (! ), only to be punched in the head by Nagisa's father both times for doing so, telling the boy that he's underage and shouldn't be indulging in such things (a joke he continues to do a few more times throughout). In contrast, Nagisa's mother is rather nice and sweet (she's voiced by Kikuko "Belldandy" Inoue, after all), but rather openly admits at one point that her husband's childish behavior annoys her a bit. It's the little things like these, as well as the funny and cute Dango Family song, that show that, yes, an anime based on a dating simulation can be funny and interesting when it wants to be. Although similar in overall style to the recent series from Kyoto Animation, the character designs are different. They're done by Megumi Kadonosono (who did the character designs of Kiddy Grade), and they're a little cleaner and prettier than both the game and the series, with the characters' eyes also being slightly smaller and more expressive as a whole. The backgrounds are good but generic (aside from the dream sequences, some of which are trippy), and the animation itself is only slightly above typical Toei animation television standards. Unfortunately, this is a movie, and one generally expects much better animation in a movie. I would dare say Kyoto Animation's television series has generally better animation than Toei's take on the franchise. This isn't to say that the Clannad movie looks bad, though. The animation might be sub-standard for a theatrical film, but the visuals are uniquely stylized at times. Director Osamu Dezaki is a long-time anime director who's been praised in the past for his use of angles, split-screens, and watercolor still frames in his works, which date back to as far back as his work on the original 1963 Astro Boy! It works surprisingly well in Clannad, although the overall design makes the movie look much, much older than it is. It's almost as if the movie looks like it came out of 1991, and the odd mishmash styles of music, which range from typical dating-sim piano pieces, modern-day bouncy, happy tracks, to jazzier music tracks that sound vaguely similar to that of late 80s television, doesn't help its aged look, either. Despite the aged art and slow points in the script, I enjoyed the Clannad movie as a whole. Although it's not as funny or well-designed as the later series from Kyoto Animation would be, it still stands on its own two legs as a complete work, one I easily recommend to all those who've seen and enjoyed Clannad to date. Recommended Audience: There's quite a bit of blood here and there throughout the movie, and some of the later parts of the movie can lay down the dramatic aspects of its characters at times. There's also a boy visibly peeing on a wall at one point of the movie as well. No fan service, but I still would only recommend it for teenagers and older.